Our Georgia grands set to work embellishing pumpkins from a pumpkin patch foray earlier that crisp October Sunday afternoon during a visit from Husband Walter and me. Stella all worked on small pumpkins. Charlie picked a bigger pumpkin to create a larger-than-life feline. 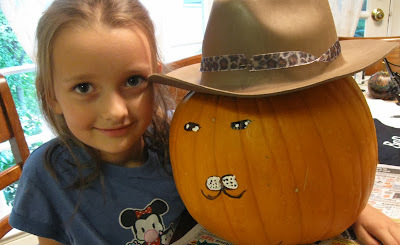 Granddaughter Charlie had a school assignment to decorate a pumpkin as a literary character. She chose the fairy tale protagonist Puss in Boots. 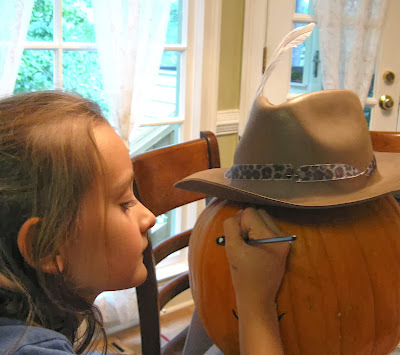 Before visiting the pumpkin patch, Charlie had found a hat that struck her fancy. She equipped it with an animal print ribbon as a band and a feather leftover from previous family projects. She attached the feather with silver duct tape. I thought the duct tape was a clever touch and looked like a sizeable silver clasp perfect for the feline character’s attire. 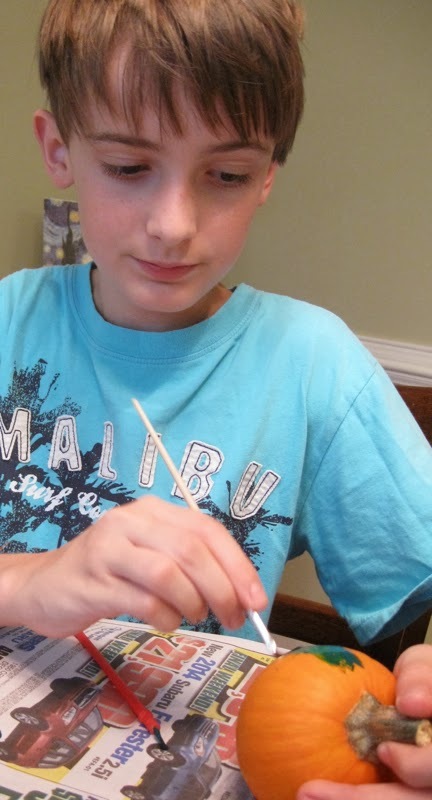 I admit my enthusiasm for the duct tape clasp could actually have been the effect of a proud grandma’s predisposition for enthusiastic approval of the entire project. A proud Charlie poses with Puss in Boots. Oh, Charlie did beautifully! And I see the detail and precise beauty in her painting, too! I had our girls use markers, but I think the paint looks better, it really makes the features pop!! Sweet photos of the Grands. I love the little concentration tongue. 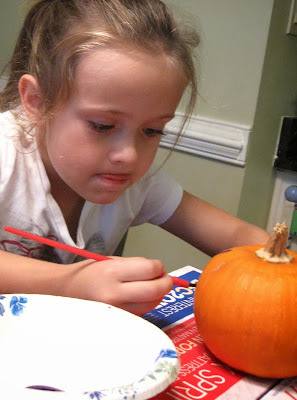 I sort of miss the little ones and all the pumpkin decorations. Ha, Stella is just as serious decorating as she was picking the perfect pumpkin. Charlie did a terrific job with hers. Very creative. Both boys are really into their craft. What a great idea for the kids. 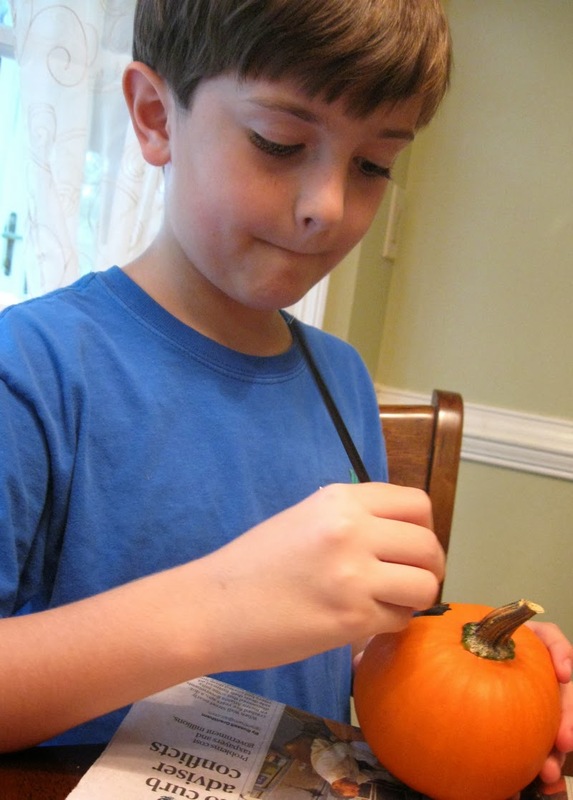 Don't you just love to watch their creativity when decorating pumpkins. So cute!!! Looks just like old Puss.